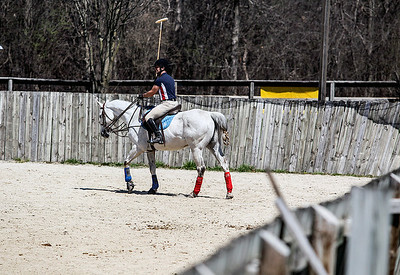 Sarah Nader- snader@shawmedia.com Tommy Bitsiaras of Mount Prospect warms up while learning to play polo at the Barrington Hills Polo Club's annual spring school for beginners at Fox Creek Stables in Wauconda Saturday, April 26, 2014. 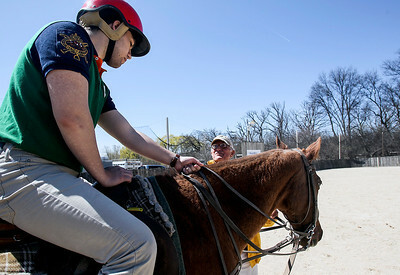 The school is one of the only schools in the Chicago area that caters to beginners and is open to all ages, genders and levels of riding ability. 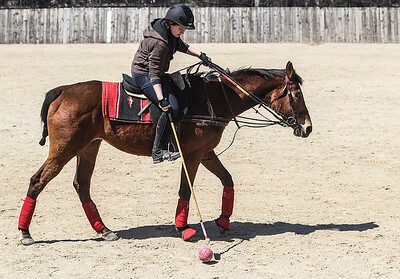 Sarah Nader- snader@shawmedia.com Aria Pounaki, 23, of Gurnee practices hitting the ball while learning to play polo at the Barrington Hills Polo Club's annual spring school for beginners at Fox Creek Stables in Wauconda Saturday, April 26, 2014. The school is one of the only schools in the Chicago area that caters to beginners and is open to all ages, genders and levels of riding ability. Sarah Nader- snader@shawmedia.com Instructor Nadir Khan (right) of Fox River Grove shows his students how to tie a halter on to a horse at the Barrington Hills Polo Club's annual spring school for beginners at Fox Creek Stables in Wauconda Saturday, April 26, 2014. The school is one of the only schools in the Chicago area that caters to beginners and is open to all ages, genders and levels of riding ability. Sarah Nader- snader@shawmedia.com Aria Pounaki (left), 23, of Gurnee watches as Tommy Bitsiaras of Mount Prospect practices putting a halter on a horse while learning to play polo at the Barrington Hills Polo Club's annual spring school for beginners at Fox Creek Stables in Wauconda Saturday, April 26, 2014. The school is one of the only schools in the Chicago area that caters to beginners and is open to all ages, genders and levels of riding ability. Sarah Nader- snader@shawmedia.com Lauren Potempa of Deerfield hits the ball while learning to play polo at the Barrington Hills Polo Club's annual spring school for beginners at Fox Creek Stables in Wauconda Saturday, April 26, 2014. The school is one of the only schools in the Chicago area that caters to beginners and is open to all ages, genders and levels of riding ability. Sarah Nader- snader@shawmedia.com Aria Pounaki (left), 23, of Gurnee gets some pointers from John Rosene of Barrington Hills while learning to play polo at the Barrington Hills Polo Club's annual spring school for beginners at Fox Creek Stables in Wauconda Saturday, April 26, 2014. The school is one of the only schools in the Chicago area that caters to beginners and is open to all ages, genders and levels of riding ability. 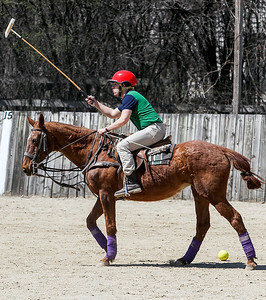 Aria Pounaki, 23, of Gurnee practices hitting the ball while learning to play polo at the Barrington Hills Polo Club's annual spring school for beginners at Fox Creek Stables in Wauconda Saturday, April 26, 2014. The school is one of the only schools in the Chicago area that caters to beginners and is open to all ages, genders and levels of riding ability.